Opening weekend $9.779 million on 1266 screens. Rated R for pervasive drug use and language, and for sexual dialogue. Somewhere out there, you might find a cruder and more unlikable comedy than How High. Somewhere out there, you might find Bigfoot partying with Elvis as well. I think you’re more likely to discover the latter, for High offers a tremendously nasty and obnoxious experience. 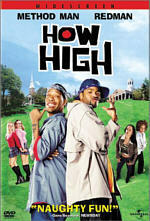 High follows the lives of urban stoners Silas P. Silas (Method Man) and Jamal King (Redman). They meet while on their way to take a college entrance exam. Both fire up a special blend Silas made from the ashes of a recently deceased friend named Ivory (Chuck Davis). Amazingly, when they smoke it, Ivory’s ghost appears and gives them all the answers to ace the test. With their perfect scores, Silas and Jamal can go anywhere they want, and they select Harvard after college Chancellor Huntley (Fred Willard) promises them a good time; the school needs more ethnic diversity, so he lies to them. Of course, these wild urban potheads stir up a ruckus when they arrive on campus. They immediately make enemies with preppie jerk Bart (Chris Elwood) and uptight Dean Cain (Obba Babatundé). They also set their sights on two Harvard babes. Apparently the only two black women on campus, Silas goes after Bart’s girlfriend Lauren (Lark Voorhies), while Jamal tries to bag Jamie (Essence Atkins), the daughter of the US vice president (Jeffrey Jones). They encounter some obstacles along the way as they attempt to stay in school and nail the ladies. How High uses the tried and true “fish out of water” routine and adds nothing to it - nothing positive, at least. The film starts with the sound of someone smoking from a bong; unbelievably, it goes downhill from there. Clearly the filmmakers intended to combine Cheech and Chong flicks with National Lampoon’s Animal House, but the project shows none of the cleverness and inventiveness of either. Instead, it substitutes broad crassness for humor. In doing so, it totally wastes a pretty solid cast. We find a nice mix of pros like Willard, Babatundé, Jones, Tracey Walter and Hector Elizondo, all of whom are totally wasted. Do these folks need paychecks that badly? Most escape fairly unscathed, at least, though I cringed when the filmmakers dressed up Elizondo in hip-hop gear. Well, at least we find the answer to the question “whatever happened to Lisa Turtle?” with this appearance from former Saved By the Bell actress Voorhies. As for the lead actors, the rap stars actually show some talent. They come across naturally and seem like they’d probably do well in further roles. Granted, these parts probably didn’t stretch their talents much; mostly they just needed to act stoned, and I get the feeling they know how to do that. Nonetheless, they demonstrate potential as actors. Too bad the film itself is a total disaster. Bizarrely, the flick was directed by Bob Dylan’s such Jesse. I didn’t even know he had a son Jesse! High offers his directorial debut, but unlike his stars, Dylan shows no promise based on the evidence seen here. High is an absolute mess. It goes for the cheapest of cheap laughs and seems virtually incoherent most of the time. Geez, they actually tried to get laughs by naming a character “Dean Cain” and retitling the SAT the “THC”? That’s pathetic. Plot lines come and go at random, and not a single character ever becomes anything more than a vague stereotype. Essentially it feels like a lot of bad gags hooked together with a loose theme related to the guys’ attempts to pass their classes. Crass humor can be funny, but it needs to exhibit some form of cleverness or wit. Neither appears here, as the filmmakers mistake crudeness for hilarity. How High also delves into potentially offensive territory with its stereotypical portrayal of blacks. Of course, the filmmakers likely will try to get off the hook with the explanation that all races get bad treatment in the movie, and they’d be correct; High is an extremely broad farce that parodies many ethnic groups. Nonetheless, that doesn’t excuse the negativity; if anything, it might make it worse. Oddly, High actually displays a bizarrely progressive viewpoint at times. Lauren is one of the very few characters with no obvious flaws, and we also see a white Vice President with a black daughter. We get no explanation how that happened, and that’s fine with me; I think it’s cool when such an occurrence is treated like nothing special. Unfortunately, those are pretty much the only positives I saw during How High. These islands of positivity are buried under acres of gross-out and drug humor and also compounded with aggressively obnoxious and unlikable characters and situations. Your enjoyment of How High will depend on how high you are. Totally baked, it’s probably a riot. Of course, totally baked, you can stare at your hand for hours. Taken straight, the film’s a total disaster. How High appears in an aspect ratio of approximately 1.85:1 on this single-sided, double-layered DVD; the image has been enhanced for 16X9 televisions. While not a flawless effort, How High offered a generally solid picture. Sharpness usually appeared fine. Some wide shots displayed modest softness, but those occurred infrequently. For the most part, the image seemed reasonably crisp and well defined. I saw no concerns related to jagged edges or moiré effects, but a little edge enhancement crept in at times. This never became major, but it mildly marred some sequences. I also noticed some light grain, but otherwise the picture remained clear. Colors seemed quite good. The movie used a naturalistic palette, and the tones appeared nicely warm and rich. The colors always remained clean and distinct, and they showed no signs of bleeding, noise or other concerns. Black levels also appeared deep and dense, but shadow detail looked a little murky at times. Most low-light scenes seemed appropriately dark, but a few of them came across as moderately thick. Still, most of my complaints remained minor, as How High usually looked fine. Also good but unspectacular were the soundtracks of How High. We found both Dolby Digital 5.1 and DTS 5.1 mixes. Except for the fact that the DTS track was mastered at a higher volume level, I found the two versions to sound virtually identical. High wasn’t an auditory extravaganza, so both styles did the trick. As with most comedies, High featured a soundfield with a fairly heavy forward bias. The front channels demonstrated solid stereo presence for the music and also offered a pretty good sense of atmosphere. Elements blended together well and created a positive ambience. For the most part, the rear speakers simply enhanced that feeling. They came to life well during a few scenes, like those at parties, but as a whole, they seemed fairly passive. Nonetheless, the soundfield seemed appropriate for the film. Audio quality appeared fine in general. Some dialogue demonstrated moderate edginess, but most of the time speech seemed acceptably distinct and natural, and I discerned no concerns related to intelligibility. Music was nicely bright and vivid, and the rap-heavy track showed good bass response. Effects were also clean and accurate, and they kicked in some positive low-end when necessary; the film even included a Cheeto scene that pumped the subwoofer! All in all, the soundtracks of How High provided nothing special, but they appeared more than acceptable. Although the movie didn’t exactly set any box office records, Universal offer a surprisingly packed special edition DVD of How High. First up we find an audio commentary from actors Method Man and Redman. Both were recorded together for this running, screen-specific track. While more entertaining than the movie, I think this track will be useful mainly to big fans. The two include very little real information about the making of the film, but their remarks seem funny because they’re so blunt (no pun intended). They crack on a few things, though they spend a lot of their time telling us how much they liked everything. The commentary maintains a decent crude energy during the first half of the film, but the participants fade pretty badly during the last 45 minutes. If you just want to hear Method Man and Redman be themselves, you’ll like this commentary. If you want lots of details about the production, skip it. Even less useful is The Making of How High, a 21-minute and 40-second snoozefest. The “documentary” offers the usual mix of film clips - lots of them - plus some shots from the set and interview clips. We hear from a slew of participants, almost all of whom are actors. Producer Danny De Vito pops up very briefly at the start, but after that, we only get remarks from the on-screen talent. The program includes material from Method Man, Redman, Lark Voorhies, Fred Willard, Obba Babatundé. Essence Atkins, Anna-Marie Horsford, Chris Elwood, Hector Elizondo, Thieu Tran, Justin Urich, Al Shearer, Mike Epps, and Sen Dog and B-Real of Cypress Hill. The show’s a total dog. We learn almost nothing other than plot and character points plus statements about how great and talented everyone was. It’s a dull promotional piece. In addition to this material, occasionally the program’s “interrupted” for reports from “WTHC”. This mainly shows Al Shearer as he roams about the set. Some of this is almost interesting - like a chat with the first assistant director Mark Little - but for the most part, it doesn’t add anything to the program. More interesting is the DVD’s collection of Deleted Scenes. We find a whopping 22 clips here, all of which appear as one running 21-minute and 58-second program. Oddly, although some chapter encoding occurs, it doesn’t allow you to skip to the start of each snippet. You can move to the 7:05 mark and the 14:04 spot, but that’s it. Anyway, the deleted scenes will seem enjoyable to fans of the movie. I saw nothing to differentiate them from material that made the final cut; none of it’s funny to me, and the deleted clips are no less entertaining than the end product. I’d guess that this stuff failed to appear due to time reasons. Anyway, the footage did nothing for me, but fans should like it. The same goes for the two minutes and 54 seconds of Outtakes. These are the standard goof-ups and line flubs, some of which already appear in the movie’s end credits. (Due to its inclusion in the documentary as well, this means I had to watch Method Man, Redman and Al Shearer act like idiots as they yelled at the audience three times!) I don’t care for most outtakes, and these did little for me, though again, fans will probably enjoy them. In that same vein, we find a collection of music videos. Up first is a clip for Method Man and Redman’s “Part II”. 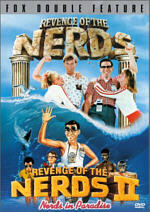 The four-minute and 10-second video mixes lip-synch shots, clips from the movie, and new material in which MM and RM emulate scenes from flicks like Animal House and Revenge of the Nerds. This exists mainly to give the videomakers an excuse to show some scantily clad babes do some booty-shaking. The video had potential but didn’t live up to it; it remained standard fare. I felt similarly toward the clip for a remix of “Round and Round” from Jonell and Method Man. It’s more lip-synching, movie snippets, and a little drama in which MM and Jonell debate their relationship. Is it just me, or do half today’s R&B/rap songs from women tell men they don’t need them, and the other half whine about how badly they need a man? Anyway, this one falls into the former category; MM adds counterpoint. It’s a dull video. Lastly, the music video area includes a 30-second “soundtrack spot”. It’s just a quick ad for the album. Speaking of promos, we find a slew of trailers on the DVD. In addition to the standard clip for How High, two other domains include ads. In Universal Showcase, we discover promos for the upcoming theatrical releases of Undercover Brother and 8 Mile. To my surprise, the former - which stars Eddie Griffin - actually looks like it might be funny. The latter stars Eminem; I’ll definitely have to reserve judgment there, though the fact that Curtis Hanson directs the flick ups its potential. Under the Now Showing banner, a few other ads appear. We get trailers for , American Pie 2, Fast Times At Ridgemont High and Half Baked. Next we find a few text features. In the Cast and Filmmakers area, we locate biographies for director Jesse Dylan plus actors Method Man, Redman, Mike Epps, Jeffrey Jones, Fred Willard, and Obba Babatundé. These seem short but decent. In addition, we get five screens of Production Notes. I found those to be superficial and bland. For those who like to find Easter Eggs, How High offers a field day. The main avenue for these comes via “Hide the Stash”. Click on that option and you’ll get a quick message from Method Man and Redman; they instruct you to locate the hidden “stash” on the DVD. You’ll discover a slew of red herrings, though; each of these produces videotaped comments from the actors, who berate your inability to succeed. When you finally do find the stash, however, the reward seems weak; they let you know you’ve done it and that’s that! We should have received something more special after all their nastiness. Actually, one other egg appears on the disc. Highlight “Hide the Stash” and click to the right. There you’ll get a 28-second outtake with Mike Epps as Baby Powder. It’s not very interesting, but it beats the pointless “Hide the Stash” nonsense. Finally, for those with DVD-ROM capabilities, we get some Weblinks for Universal Home Video, Universal Pictures, Universal Studios, Universal Theme Parks, and one that will let you sign up for the Universal DVD newsletter. I may have seen a crummier, less funny comedy than How High, but I can’t think of it off the top of my head. This sucker’s a train wreck with absolutely nothing worthwhile on display. It wastes a good cast and a few million dollars. The DVD provides fairly good picture and sound plus a reasonably nice roster of extras. 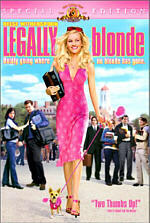 If you liked How High, you should feel very pleased with this DVD. However, if you’re not already enamored with it, I definitely can’t recommend this thoroughly atrocious film.